Hello, readers. Hope your Life Days went well. The blog is kicking off 2016 by continuing to take the Star Wars universe down another peg, here, at this heady time of its revival. Yes, yes, I’ll get back to The Avengers soon. But for now, someone’s in the kitchen with Malla. And that’s it for the interaction. None of the four dials on the base of the screen are touched throughout the five minutes of the cooking show. It’s quite nice that she didn’t have to press play at all, but that’s a minor note. The main thing to talk about is how nice the physical tokens are as a means of finding a recipe. We don’t know exactly what’s printed on them, but we can tell it’s enough for her to pick through, consider, and make a decision. This is nice for the very physical environment of the kitchen. This sort of tangible user interface, card-as-media-command hasn’t seen a lot of play in the scifiinterfaces survey, and the only other example that comes to mind is from Aliens, when Ripley uses Carter Burke’s calling card to instantly call him AND I JUST CONNECTED ALIENS TO THE STAR WARS HOLIDAY SPECIAL. …but then Harvey wouldn’t have had his moment. And for your commitment to the bit, Harvey, we thank you. In the center of the kitchen, mounted to the ceiling, is a Garden Center. Out of use, it retracts out of reach, but anyone in the family can say Fruit, please and the Garden Center drops down to allow fresh grapes to be plucked right off the vine. When done, Marty Jr. tells it to retract with a thump on it, and it retracts back up to its resting place near the ceiling. This is wonderful. Responds to many types of inputs and keeps healthy, fresh fruit available to the family at any time. This appears in the background of the dinner scene, but I cannot tell what it does. Anyone? Lorraine prepares the family a pizza using a hydrator. She opens a sealed foil package, branded Pizza Hut, and removes a tiny puck of a pizza, placing it in the center of a large pizza tray. She inserts the tray into a hydrator oven and closes the hinged front door. A small green light illuminates on its panel. She puts her mouth close to the device and instructs it to, Hydrate level 4, please. A red light illuminates as a bubbling sound is heard for a few seconds. Then a timer bell rings, and both lights extinguish. Lorraine removes a full-sized and fully-cooked pizza from the oven. It could be improved by not having her have to remember and enter the level of hydration. There might be an argument that this helps the hydrator feel like they’re doing enough effort, like the legendary Betty Crocker egg story. While snopes tells us that the usual version of this is poppycock, but also references Ernest Dichter’s research in which yes, the first generation of homemakers using instant cake mixes felt that a preparation that was too easy was too indulgent. So, perhaps the hydrator is first generation, and later generations will be able to detect the hydration needed from the packaging. 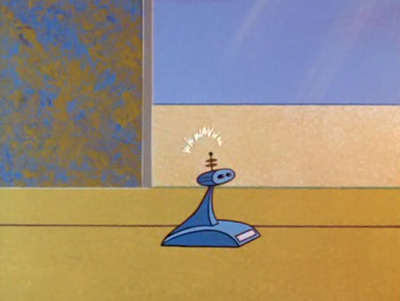 To illustrate his capitalist ideology, (a high-tech version of the parable of the broken window) Zorg activates his automatic cleaning robots. To do this, he deliberately crashes a glass to the floor, where a set of robots come scuttling out from beneath his desk and begin cleaning up. Three of them serve to demarcate the space as a ”robots working” zone, with tall masts from which red beacon lights warn anyone nearby. In the middle of these three, a sweeper robot gathers the large pieces of glass with broom and dustbin actuators. Then, a vacuum robot spins above the location to remove the fine pieces of glass. The robots are meant to do their job safely and efficiently, and then put themselves away as quickly as possible. The main “interface” task they have is to keep nearby humans informed and safe. (Did Asimov write a law for vacuum cleaners?) A minor secondary goal might be to distinguish the function of each by their shape. The robots inform observers explicitly with the stanchion robots’ beacon lights and bright red patterns. In addition, the whirring sounds of each robot’s motors and actuators help to reinforce the fact that they are working. If they were completely silent they would be more problematic for people not looking or unable to see. The beacon might be a bit of overkill and distracting to someone at a distance, but since the robots are small enough to be a trip hazard, and Cornelius is in fact less than a meter away at the time of sweeping, I can see why it might be needed in this particular case. That they are each readily distinguishable means it might be easier to intervene or select a particular one for maintenance. So, aside from the faulty logic they’re meant to embody, mostly really well designed. The main improvement I can imagine is that the system might reduce the trip hazard by unifying these disparate functions in a single device, and then either keeping them stanchion-high or flattening its top out like a step. But then we’d just have invented Roomba five years early.